Aficionados of the late Alfred Wainwright climbed a Lakeland fell as part in an event to light up the district’s mountains. 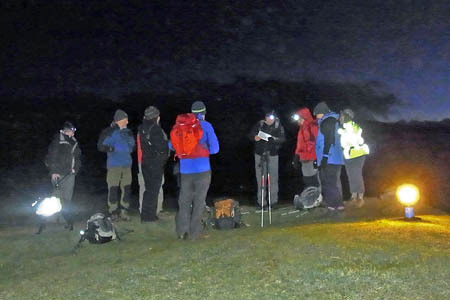 Fourteen members of the Wainwright Society were among hundreds who lit lights on the summits of the fells described by the author in an event to commemorate a police officer who was killed. The Light the Lakes event was organised by Sergeant Ian Davis, chair of the Surrey Police Federation, to raise cash for the family of Detective Constable Heather Cooper, the 33-year-old whose body was found in Blackdown Woods, West Sussex. Wainwright Society members climbed Latrigg, the 368m (1,207ft) hill overlooking Keswick, as their part in the challenge. The fellwalkers lit lanterns and lights on the summit. The Light the Lakes challenge aimed to put walkers on each of the 214 Wainwrights in the Lake District and illuminate a lamp or torch just before dawn in memory of DC Heather Cooper. Cumbria Constabulary’s chief constable Stuart Hyde was among those planning to take part. The detective, originally from York, left two young children. The Light the Lakes appeal hopes to raise £30,000 to match a similar amount already pledged by the Police Federation. Ms Cooper’s partner Peter Foster was arrested and has been charged with her murder. Im proud to have been part of this and would like to thank everyone involved on doing a superb job of lighting the fells a site i will always rember. It was very moving to see the lights twinkling all around us as we stood on the top of Haystacks, AW's favourite fell. I feel proud to have been a part of this and congratulate all involved. The total raised by members of The Wainwright Society is now £250! It was an amazing thing to be part of & so magical when all the lights started appearing.